Consider Using Your Rent to Purchase a Home! If you can afford to rent, chances are that you can afford to purchase a home. Start building equity for your future by saving 5% for a down payment to buy your OWN home. Your monthly mortgage payments may be similar to your monthly rental payments! Determine your maximum monthly mortgage payment budget. Make sure you account for closing costs which include legal fees, land transfer fees and property taxes on your new home. Most importantly speak to a professional to effectively evaluate whether buying is right for you. A mortgage broker can help determine your affordability and find a mortgage product that suits your needs. Brokers have access to over multiple lenders, including most of the major banks and can guide you through the home buying process. 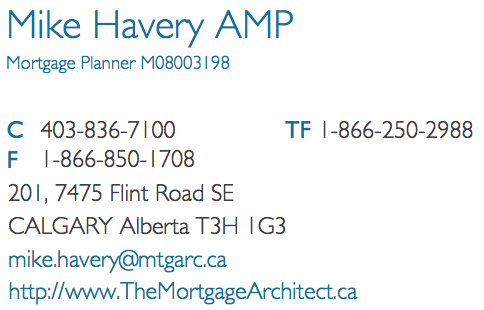 If you are renting and would like to speak with a specialist about your options, consider contacting Mike Havery with Mortgage Architects. You can download his My Mortgage Planner App using the following link: Download App. It includes everything you need to estimate your home ownership costs, includes Land Transfer fees, closing costs , and much more. Contact Mike Havery today to stop renting and start owning! Exceptional pricing – Mike offers rates from over 50 lenders. Previous PostExecutive Inner City Home In Mount Royal!